This page discusses the spirit world spheres or abodes of deceased humans in the spirit world. After death, when a spirit — human without the physical body — first enters the spirit world, its condition of mental, moral and spiritual development determines its place of abode. Most start on the earth plane, in which there are several spheres. Here conditions are not too different from those on earth with the same ideas of right and wrong, beliefs, ideas and desires. Friends and relatives can help and instruct the newly arrived spirit on how to proceed higher. 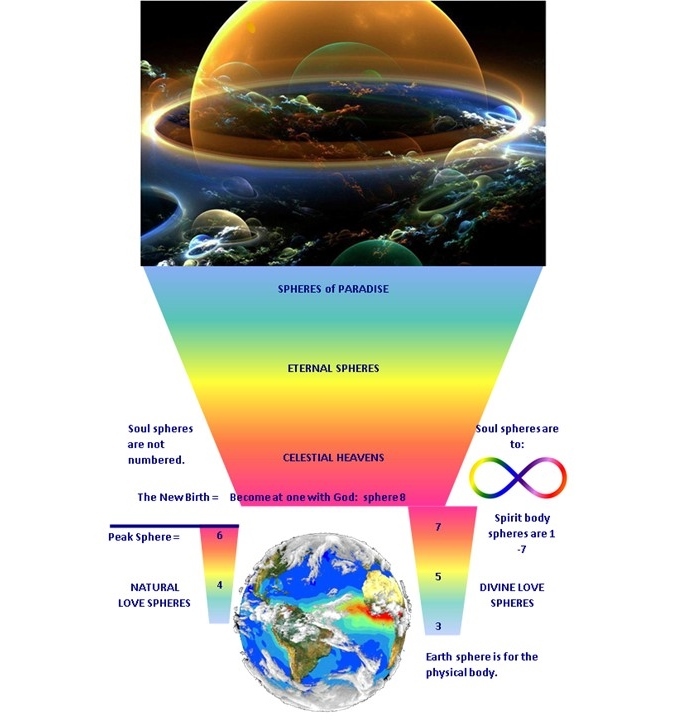 Depending on the spirit’s soul condition as well as priorities, they will move through the various spirit world spheres along the lines of intellectual, moral, or spiritual development. The last of these involves actively seeking the Divine Love and New Birth and is the only way to the Celestial Spheres (God’s Kingdom). Those who make their highest priorities the seeking of the Divine Love and the development of their soul are assigned to the Third, Fifth, or Seventh Sphere. Many of them are more advanced in the mental and moral development than the inhabitants in the Sixth Sphere, for with the soul development through the Divine Love automatically comes mental and moral development. This is because the mind is only an attribute or quality of the soul. Indeed, by seeking God’s Kingdom first, all else is added (Matthew 6:33). At the Seventh Sphere (highest below the Celestial Spheres), the intellectual and moral qualities are developed to the highest degree and the Divine Love is also present in the soul, but a little short of reaching at-onement with the Father. Here the mind becomes so subordinated to the powers and operations of the soul perceptions that it can no longer exist as mere mind, independent of soul development. In all the spirit world spheres below the Celestial Spheres, the spirits are growing in their natural love, but still retain their worldly affections which tend to retard their progress. In the first Celestial Sphere, all the natural loves and affections are absorbed by the Divine Love and interest in the affairs of the earth ceases. Faith and prayer for the Divine Love are the only prerequisites for progressing to the higher spheres and eventually to the Celestial Spheres. Each higher sphere brings a greater happiness, even though at every lower sphere, the happiness is such that it is unimaginable that it could increase. All along, God respects the free will and desires of His creatures and will not force anyone to seek the Divine Love. Rather, He waits till they learn from their own experience and become dissatisfied with their level of happiness at the moral and mental level. With such dissatisfaction comes the desire for a Source of happiness beyond themselves. God makes his redeemed happy by setting before them an ever higher mark for which they may seek with the assurance, that it can be attained. 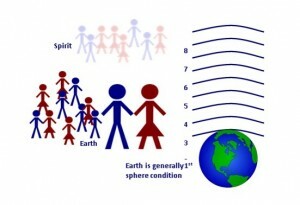 Below is a graphical representation of the spheres in the spirit world. The graphic is used by permission of John Doel of Pascas Health Foundation.